The answer is more complex than a finite 30 or 60 days, since much depends on how quickly the customer responds to different steps throughout the process. OTE will review the application for accuracy and completeness within one to two days of receipt. Our highway engineer will visit the site to determine if there is room for the proposed sign. This review is performed within one to two weeks, depending on the number of permit applications in the queue already. The proposed sign permit is forwarded to ODOT who has State’s authority over roadways and highways. The proposed site is then reviewed by the State Traffic Engineer and the local (site district) sign crews who report back to the State Traffic Engineer. ODOT will then approve or disapprove the permit (depending on state and federal regulations– some of which include sign and traffic density). ODOT has 40 days in which to complete this phase. Once OTE has received ODOT’s approval, the customer is mailed a permit which must be signed and returned to our offices with payment. The sign customer then needs to select a manufacturer to create the reflective logo. The process from ODOT approval to OTE installation can sometimes move very quickly if the customer returns their permit and payment promptly, and, if the manufacturer is familiar with the customer’s logo or brand. If the business is new, logo plaque creation may take longer, depending on the customer’s artwork and length of the design phase. Additionally, artwork and sketches of proposed logos must be approved by OTE: logo plaques are required to be visible and readable to Interstate traffic. The key to a smooth and timely installation will depend on how quickly the customer interacts with OTE’s request for permit signatures, payment, selection of plaque manufacturer, and logo design. OTE will do everything in its power to ensure your permit moves through the various approval channels swiftly. 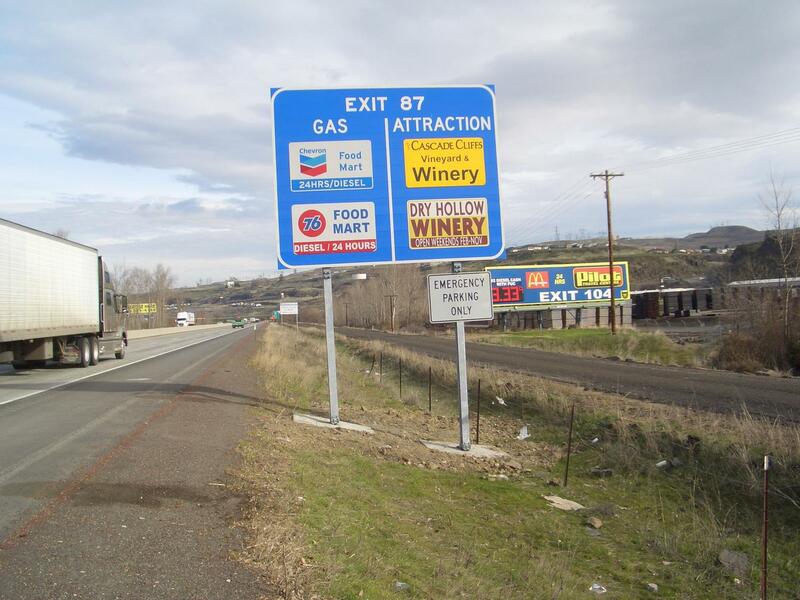 If you need help with an Oregon Travel Experience highway business sign application, please call us at 1-800-574-9397 or contact us by email. Reviewing our Interstate logo sign Frequently Asked Questions (FAQs) web pages may answer some of your other questions about our signs. What is the average cost of a highway business sign? What types of businesses can be on a highway business sign?